As mentioned in past reports Mama Bold and Gray’s “daughter” Pale did not disperse. Until mid-January and into February, Pale had teamed up with a young male that I came to call Blackie, due to his coloration. At first everything went well between the young foxes and the adults. However, on February 6, 2016, everything changed. As I walked down the road in Fox Hollow, Mama Bold and her mate Gray emerged from the brush on the right side. Gray seemed agitated as he moved about. Mama Bold went back into the weeds. Gray began to follow her, but before he came to the trail, he raised his nose and sniffed the air. He dashed down the road and off into the brush. Suddenly, from back in the brief thicket, a fox fight erupted. There was a lot of screaming and shrieks. The fight stopped. I looked down the road. There Blackie cross to the natal den. Gray had vanished. All was quiet for about three, maybe four minutes. Suddenly, from the truck washing pad, back in the bushes another fight broke out. It was brief. Gray came from the brush next to the truck washing pad in a fast trot back and headed toward the weeds, changed his mind, and headed down the road toward fox hollow. I couldn’t keep up with him. The next thing I heard were two barks from a fox. (These kinds of barks are warnings to other foxes considered to be trespassers.) Two maybe three minutes later, Gray came from across the road and went back into the weeds. Prior to this incident, on several occasions, I had witnessed Mama Bold baring her teeth and growl at Blackie. The two adults had made it clear that Blackie was no longer tolerated anywhere in the region. After Blackie left, Pale hung around and I think she tried to make amends with her parents. One afternoon about a week later, Pale came to her father Gray exhibiting all of the submissive behavior she could muster but Gray attacked her. It was the first fox fight I’ve ever seen where fur literally flew. When the fight was over, Pale went over to where her father had been lying. She took over his spot. (What, by this gesture, was Pale telling her “father”?) Pale finally left the area and now she and another fox, new to the area, have their own place on the opposite side of the water treatment plant. In this case Mama Bold and Gray had to use violence in order to get the youngsters out of their territory. I have witnessed this on several occasions. So, what does this have to do with dispersal? At Marker #15 in the overflow channel along Matadero Creek, the alpha male Dark came from the edge and crossed the green grassy area that fronts the brushy thicket. I wondered if his mate Cute was there. Sure enough, she rose from the weeds, stretched and came on out to the channel. I decided to just head on back to the big clearing to reset my trail camera. It seemed like the foxes were going to stay up near the end of the channel. I stood on the trail crossing the berm, when suddenly Dark Eyes (Alpha female of the region), Big Guy (Juvenile male) and Cute trotted along the trail. Cute, Dark’s mate and Big Guy her “son” stopped nearby. I didn’t pay too much attention to them, turned back tow ard the clearing when I heard a growl from behind. When I looked, Big Guy was trying to get up on his mother’s back. She turned, bore her teeth at him and growled. I assumed that it would be a fight. I turned on video in my camera. He snapped at her, then came around behind her, planted his paws firmly on her back and sexually took her. She hovered for upwards of a minute. Cute dashed away from him. He ran after her. I followed. They were down in the brush and he was on her again. An aside: After that encounter, I lost track of them. I left the berm to see if I might find her. There was a fox at the end of the channel. Dark, her mate, was there. As I approached, he raised his nose, sniffed, hurried over to the edge of the grass, paused for a tense 20 seconds or so, then bounded into the tall grass. He came out with a field mouse cinched in his jaw. On video I caught him devouring the whole rodent. He did not play with it as is usual for gray foxes; nothing. He ate it, then sat there at the end of the channel completely content. It’s rather clear that inbreeding is occurring along the San Francisco Bay, at least in one location. To sum up: Adults probably know that if their young remain in their home region for too long, there will come a time when the males will become driven by their inborn sexual urge, an urge they possibly cannot control. Any female in the area that is in estrus is liable to become pregnant by these genetically related males. Therefore, it seems imperative that the young disperse so as to avoid inbreeding. Is that one principle reason why some gray fox adults use violence to force their young to disperse so that the genetic lineage does not become contaminated? It appears as though that may be the case as I have seen the use of violence on their fully grown children on at least five occasions. In 2011 a chubby, floppy eared fox came into the region, denned up over on Harbor Hill at the intersection of Embarcadero and Harbor Roads. For the first time since then, Floppy the gray fox has reappeared. He is likely to be a victim of inbreeding. There are presently 13 stable gray foxes in the area monitored. 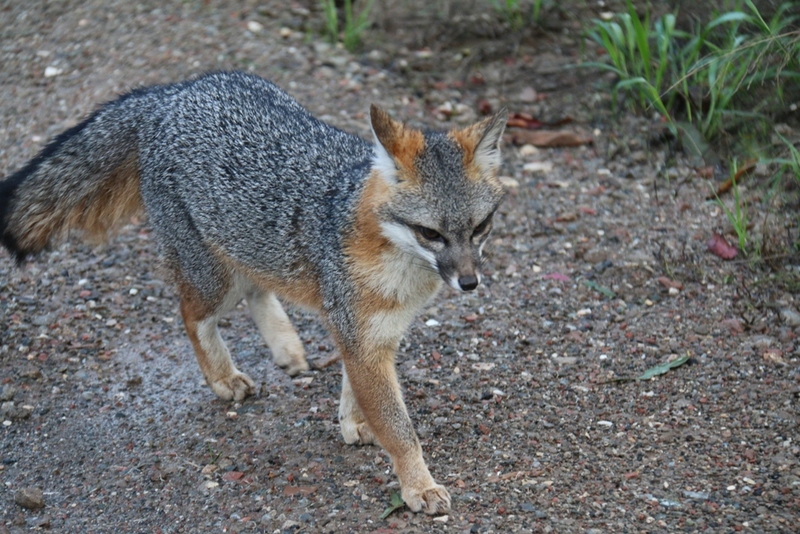 Monitoring of urban gray fox denning sites in Palo Alto Baylands. This is being accomplished during the period when the gray foxes use a den site. It is one of the prime locations for gathering most of the behavioral data on the litter and on adults alike. 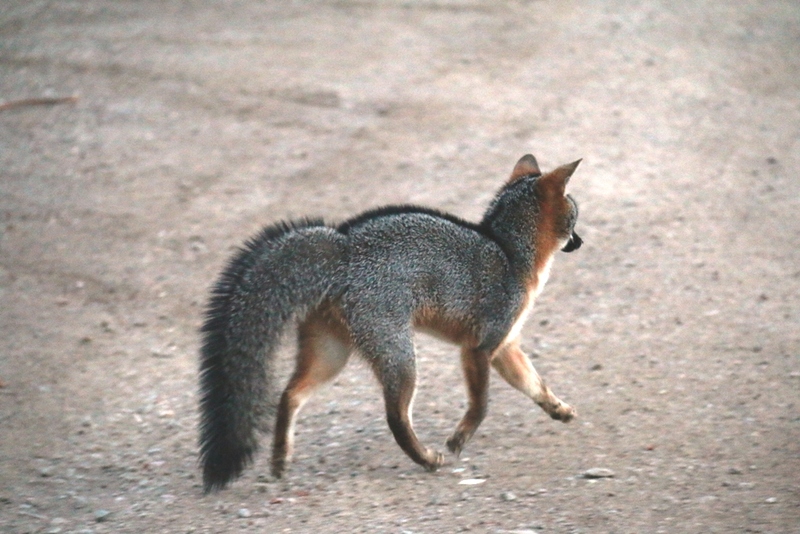 Assessment of status and population trends of Bayland’s urban gray foxes. 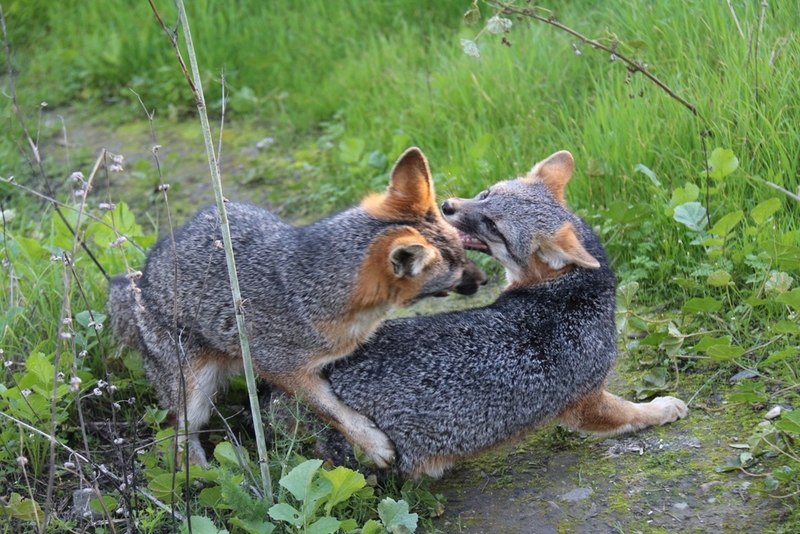 See above – As of June 2015, it appears as though the number of gray foxes at the baylands has declined considerably. This brings up the question: As with coyotes that can regulate the number of pups born in a region, might also gray foxes do the same? Identification of habitat features that promote the presence of urban gray foxes. As stated in a previous gray fox report, there is a need to undertake some work to increase the habitat features required by the gray foxes and other wildlife in an area where a road was built that borders the saltwater channel. I asked construction supervisor Frank Muzzi about this and he felt that the old growth Coyote Bush would grow back within the coming year and therefore accomplish the same goal. After considering this and talking with people who know how to restore habitats, we need to assess what kinds of plants would grow best along the edge of the saltwater channel and alongside the marsh. The Alkaline Saltbush is one but there are probably others as well. We need to grow a permanent habitat that contains the corridors and plant it as soon as possible. We’ll keep an eye on this as this is a critical link between the southern region of the baylands and the northern region. Assessment of reproductive success and identification of factors that promote successful reproduction. Last month I wrote that gray fox reproduction at the baylands appears to be holding steady with an average of 3.3 pups developing to maturity during the 2013 and 2014 seasons. As noted above, the 2015 season has fewer pups than in years past. Solution? Open up the pinch-point along Matadero Creek by developing thickets that link one area to another. Identification and assessment of possible dispersal travel routes. Presently there can only be guesses as to dispersal travel routes. We intend to make this important question much more concrete when we attain our collaring/take/capture permit from the Department of Fish & Wildlife. UPDATE – As of July 27th, the Urban Wildlife Research Project has a fully licensed and permitted biologist experienced in handling mammals willing to capture and collar a number of adult and juvenile gray foxes when the time comes. Until next month, I hope that your endeavors are productive and rewarding. Take care. Please include me in your email list on the fox report. Have gray foxes in the ravine behind our house in Pinole.